Dominican Rum bursts from red apples! Ron Barcelo are a Dominican Rum brand that is situated in San Pedro de Macoris. Julien Barcelo, a native of Mallorca, founded the company in 1930. It grew until the 1980s, when it really took off and became one of the most popular Rum brands in the Dominican Republic. It is now exported to around 50 countries and is an international favourite. 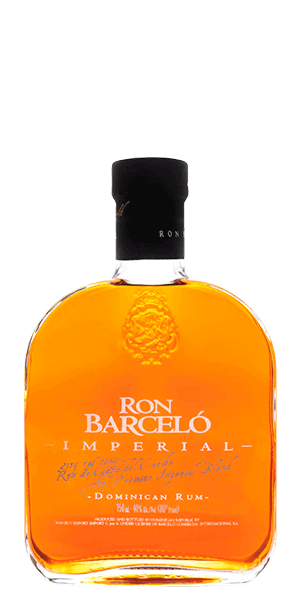 What does Ron Barceló Imperial taste like? The Flavor Spiral™ shows the most common flavors that you'll taste in Ron Barceló Imperial and gives you a chance to have a taste of it before actually tasting it. Long and blunt, with the oakyness becoming the main flavour"
Caramel nose. Very earthy flavor. This is what most American rum drinker are looking for, a rich sweet rum with a bourbonesque profile. I Personally, prefer the more "Rummie" flavors of the island backstreets but this bottle went very fast at the party!!! Love this rum. Great for sipping. Very smooth, not too sweet. An amazing distillation, not overly spiced like alot of rum, very gentle mouthfeel, delayed warmth but no burn, subtle hints of vanilla and the main attraction is it's oak aged origin. Born in oak casks this rum has a toasted oak flavor that is perfection in itself. And that is to say it is not a green oak flavor. It is not a burnt oak flavor. It is a roasted/toasted oak flavor. Kudos to the tree that became that barrel, kudos to the cask maker , kudos to whoever charred the barrel to but not past a desirable flavor range. Taste like a bourbon so refined that anything but a cold glass and 3 ice cubes is blasphemous. If the bottle didn't say rum you'd never know. Very good. I just thought it was smooth and a little sweet like good rum usually is. It had a nice alcohol hit and no burn at the end. It felt velvety on the tongue and left all of its notes on you pallet as the taste melts away. Will buy it again. Haven’t tasted it mixed yet as I really enjoy it straight right now. Very smooth and flavorful. It works well in mixed drinks or on its own. Would definitely purchase again. Like it a lot not much after taste burn. Extremely smooth up front with just the slightest burn going down the throat then right back to a pleasant finish. One of the best rums I have had in a long time. Will definitely purchase again! I would not have thought to try this had it not been for the Flaviar recommendation based on my flavor profile. I am not usually a rum drinker--bourbon is my beverage of choice--and this was a great match. Bourbon-like, but sweeter, with caramel notes. Loved it! This opens the door for other rums, I think. Super smooth I love it!!! Worthy to try. Has a caramel & honey flavor; a bit smokey. Very easy to drink.. This is fine sipping rum from the Dominican Republic. It will hold a candle to any high end rum on the market. Not bad, but not quite smooth enough to be considered among the very best.